Lock in a great price for Holiday Inn Express Grand Canyon – rated 8.2 by recent guests! Location was easy to find, close to the tours we wanted, close to restaurants. Great pool and breakfast and friendly staff. It was better than we expected!!! The location near the Grand Canyon can’t be beat. The staff is also very friendly and helpful. They offer a basic free breakfast and the staff manage the chaos well as a ton of people descend on breakfast at once. The rooms are also pretty clean. The things that the hotel can control on a day to day basis, they do well. The downside is that the hotel is in need of a major update and a thorough cleaning, including the carpet. The place felt and looked like it had received a lot of traffic every day — for decades—, and that the wear and accumulated dirt needed to be addressed via a deep cleaning. That said, there are not many hotels to choose from in this remote location, so I would probably stay again. But this place would be so much better if they took the time to refresh the rooms during the off-season. The hotel room was very clean and the staff was friendly. The location in Tusayan was perfect to get to the Grand Canyon National Park. After a day of hiking, we really enjoyed the pool and hot tub with the kids. Breakfast was good. Good selection and the Cinnabons were a nice surprise. It was very convenient to the park entrance, which was the only reason to stay there. The hotel is always full because of it's location, hence I don't think they give a hoot about the staff being friendly or the rooms being clean, ours was really dirty. Thank goodness we were only there 1 night. Location very close to the the entrance of the Grand Canyon visitor center at the south rim. Property is new and clean. Our room had more than enough room. We were in the smaller back building. It was quiet and had it’s own breakfast area that had everything the front building had. Wish I had stayed an extra night. They have an adults only building which is nice. Breakfast was good, had hot and cold selections. Room was spacious with a separate sitting room, fridge, sink, coffee maker. Bathroom was large. All in all a good place to stay. Only comment is that it was a little pricey. 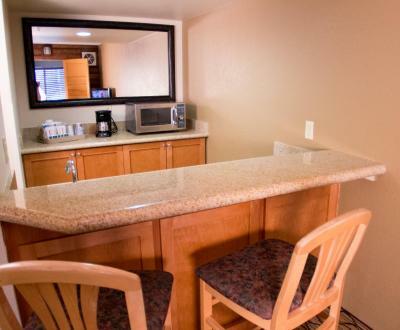 Holiday Inn Express Grand Canyon This rating is a reflection of how the property compares to the industry standard when it comes to price, facilities and services available. It's based on a self-evaluation by the property. Use this rating to help choose your stay! Featuring an indoor swimming pool, this Grand Canyon, Arizona hotel is 15 minutes’ drive from Grand Canyon National Park. Free Wi-Fi is provided in all rooms. 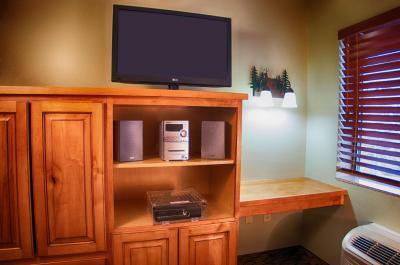 A flat-screen TV with cable is featured in all guest rooms at Holiday Inn Express Grand Canyon. Simply furnished, each air-conditioned room features coffee-making facilities. A hot tub is provided onsite at Grand Canyon Holiday Inn Express. Fax and photocopying services are offered onsite. Phenix Sky Harbor International Airport is 229 mi away, while Kaibab National Forest is 14 mi from Holiday Inn Express Grand Canyon. This property is also rated for the best value in Tusayan! Guests are getting more for their money when compared to other properties in this city. 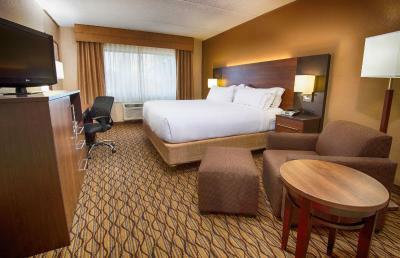 When would you like to stay at Holiday Inn Express Grand Canyon? Featuring free Wi-Fi and a flat-screen TV with cable, this room comes equipped with coffee-making facilities. Rates are based on 2 guests. A maximum of 4 guests can stay in this room. Featuring a separate living room, this two-bedroom suite provides free Wi-Fi, a flat-screen TV, a sitting area and a private bathroom. A full kitchen and dining area are also provided. The rates are based on 2 guests. A maximum of 4 guests can stay in this room. Please note this room may have a roll-in shower or a pull-down seat in a bathtub and it is on the first floor. 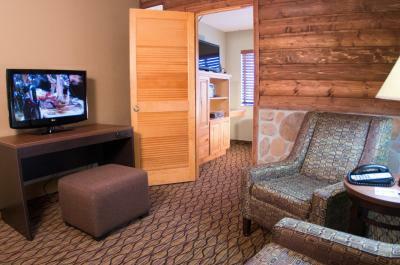 Featuring a separate living room, this suite includes free Wi-Fi and a flat-screen TV with cable. 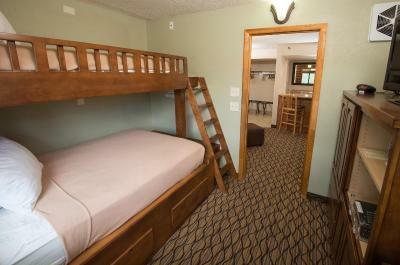 Featuring free Wi-Fi and a flat-screen TV with cable, this room comes with coffee-making facilities. This room also has a pull-down seat in the bathtub. This is room is themed for children. House Rules Holiday Inn Express Grand Canyon takes special requests – add in the next step! Holiday Inn Express Grand Canyon accepts these cards and reserves the right to temporarily hold an amount prior to arrival. Parking is also a little tight. Issue is to have a low standard hotel for such a price. Nothing was really bad but everything is a 2 star hotel standards for the price of a 3 or 4 star one. We didn't like the fact that there we no restaurant nor bar in the hotel, so it gives the atmosphere of a motel. The breakfast area is way to small and therefore crowded and the quality of the food was bad (industrial). Staff was friendly and professional, the quality of beds was good and we had a resting night. Good location. Quick breakfast possibility. Easy check out. Not luxuriuos but very practical, clean and new hotel, comfy beds, large well equipped room. Easy free parking. The amenities were better at nearby hotels for a similar price. We really enjoyed our stay.. it is a Holiday Inn so value was excellent. The Wi-Fi worked better here then in the fancier hotel we stayed at in Las Vegas! The price is quite high. Laundry facilities would have been very useful! Very expensive because of the proximity to the Grand Canyon. Breakfast - space inadequate for the number of guests. General cleanliness - a bit shabby. 50.00 difference between booking.com and hotel price. excellent location... Immelda at breakfast was awesome! Clearly, loves her job!